Approach the bridge to College of Winterhold. Prove your ability or persuade her, provided you have a high enough Speech skill. Cross the bridge and enter the courtyard. (Optional) Speak to Mirabelle Ervine. Enter the Hall of the Elements. Listen to Tolfdir's lecture and participate. Before heading to Winterhold to start this quest, you may want to check whether you have enough magicka to complete the quest's first challenge—you may need as much as 135 magicka. With the novice hood found in Helgen Keep during Unbound, even new level-one characters will have 130 magicka. If you do not have other Fortify Magicka apparel or potions, one option available to everyone is to visit the Temple of the Divines in Solitude and activate the shrine of Julianos to obtain 25 more magicka from the Blessing of Julianos. If you have the Dragonborn add-on installed, you may choose the power Secret of Arcana from the black book Filament and Filigree and all your spells will cost no magicka for 30 seconds. Once in Winterhold, follow the main road west through town, and approach the prominent bridge connecting the town to the College of Winterhold. Standing at the approach of the bridge is Faralda. She will ask you about your intentions and what you expect to find on entering the college. Several options would be available for you. I want to use the power of ice and fire to destroy any who oppose me. I see. That power certainly exists, I assure you. Wield it faithfully, and few can withstand you. I desire to bend the will of those around me. Yes, the school of Illusion can be quite influential. Kings have risen to power because of it, and empires have been razed with it. I want to unravel the mysteries of Aetherius. Ah, the immortal plane. It is said to be the source of all magic. This is a noble goal, indeed. 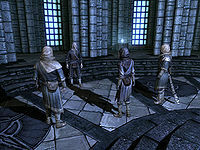 I seek the knowledge of the Elder Scrolls.† Do you? It is true there are some here who have spent years studying the accumulated knowledge of the scrolls. But what you seek does not come easily, and can destroy those without a strong will. I just wanted to see what it looks like inside. Ha! Humor is often in short supply here. But I sense that perhaps you're after more than just that. †Only available during the quests Elder Knowledge and Scroll ScoutingDG or if you have completed those quests without speaking to Faralda previously. Regardless of the dialogue options you choose, she will ultimately decide that you need a lesson and will say that you must take a small test to show that you have some degree of skill with magic. Casting a Firebolt at the eye-shaped seal next to her. Conjuring a Flame Atronach on the seal. Casting Fear at the seal. Casting Healing Hands on her. Casting Magelight at the seal. If you do not have the spell she asks of you, she will offer to teach it to you for 30 gold. This is an easy and cheap way to learn any one of the above spells. You must cast the spell at the circular impression in the floor behind her. Casting the spell in any other location will not progress the quest. However, if she asks you to conjure a Flame Atronach, and you already have a Flame Thrall summoned, simply exiting the conversation and speaking to her again will successfully progress the dialogue. Alternatively, you can attempt to persuade her and avoid this test. In order to persuade her, you will need a Speech skill of 100 (70 with the Persuasion perk) or the Amulet of Articulation. If you are on the quest Elder Knowledge you can also mention that you are Dragonborn. She will then ask to see a shout. Either of these will get you in without needing to cast a spell. Regardless of which path you take, Faralda will allow you across the bridge and direct you to Mirabelle Ervine. After you speak to Mirabelle Ervine, she will want to give you a tour of the facilities. Before that, however, she will give you three items to wear (although wearing them is not mandatory for membership): a Novice Hood (+30 to Magicka), a Novice Robes of Destruction (-12% to Destruction Spell Magicka Cost, Magicka regenerates 50% faster) and College Boots (unenchanted). As you follow her around the college, she will point and explain the few areas and what their purpose is. She will lead you to your new quarters, which is an Apprentice room in the Hall of Attainment, a circular chamber with five rooms total. One room is assigned to each of the apprentices, and one to Tolfdir. Your room is the first on the right, and includes a bed, several furniture containers, and some starting items such as a few soul gems. The furniture containers (wardrobes, end tables, and drawer) are safe for storage, but the food barrels respawn and are unsafe. "Welcome, welcome! We were just beginning. Please, stay and listen." Upon completing the tour, Mirabelle will ask you to join Tolfdir's lecture in the lecture hall. Tolfdir will begin the lesson, addressing you and three of your peers. The other students will badger the professor to teach them a practical application of magic instead of lecturing about the importance of mitigating the damages. Eventually, Tolfdir will ask you what you think. Whatever your response, Tolfdir will ask you to perform a Ward spell. If you do not have this spell, he will give it to you freely. You will be asked to cast the spell and fend off his attack with it. After you successfully defend yourself from one of his fire balls, the quest is finished, and Tolfdir will suggest a school field trip and you are off on the next quest. You can buy the Healing Hands, Magelight, Fear, Conjure Flame Atronach, or Firebolt spell from Faralda (depending on which is required for your test) for cheaper than the tome is offered in stores. If you want to purchase a specific spell cheaply, you can save before initiating the quest and reload to try again. You will also learn the Lesser Ward spell while listening to Tolfdir. If one of the three students die by any means, Tolfdir will cancel the ward training and immediately start the next quest. Without enough Magicka or spent Perks in Restoration, it may be difficult for some characters to maintain a Ward long enough for Tolfdir to even throw a firebolt. This can be bypassed by using Fortify Magicka potions, or more efficiently, Spellbreaker and its Ward effect. Several of the college's optional quests become available once First Lessons has been started, namely Out of Balance, Enchanting Pick-Up, and Restocking Soul Gems, Fetch me that Book!, and Shalidor's Insights. Another quest, Filling Soul Gems, was supposed to be available following First Lessons, but was left unfinished and cannot be started. Most of the other optional quests do not become available until after the next quest, Under Saarthal, has been completed. If you want to skip the tour, you can talk to Mirabelle Ervine and select the 'I was told to come see you' dialogue, then tell her 'I'm not ready to start the tour yet' and simply go into the Hall of Elements. The quest will progress normally once you start listening to Tolfdir's lecture. At the end of the lecture in this quest, Tolfdir's relationship with you is upgraded to friend. If for any reason you step in front of Faralda as she casts the spells during the walk up to the college, it will show up as a light spell on your character and will never light the podium. If interrupted during the tour (such as by a dragon), Mirabelle Ervine will not continue, saying only "after I have finished showing you the grounds we can talk". However, if you proceed to the Hall of Elements, Tolfdir will begin his lecture and you can complete the quest as if you had finished the tour. Mirabelle Ervine seems to return to normal behavior after this point. If you miss the first chance to defend yourself from Tolfdir's fireball, he may not throw another one at you, stalling the quest indefinitely. Tolfdir will start firing the spell on you but will immediately stop. This can be solved by simply moving around for a bit on the spot, then start casting the Lesser Ward spell again. It can also be solved by killing one of the students, running away to someplace outside of Winterhold, then paying up the 1000 gold bounty to the guards.That way Tolfdir will skip the training part, and start the Under Saarthal quest. If you dismiss a follower during the demonstration of wards (in order to, for example, keep him or her out of the line of fire), there is a chance that the entire class and any faculty present will attack the follower. Since an invincible follower stands up after kneeling for a bit, this results in a loop without a sufficient delay to continue the lesson. ? Permanently killing the follower or reloading a previous save will successfully address this issue. If you cast 'calm' on your follower, he/she will stop attacking Tolfdir and the students and you can then rehire him/her therefore solving the problem. If a dragon attacks before you can cast the spell Faralda has requested, she will disappear entirely from the game. 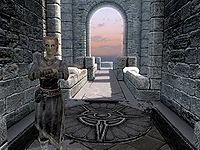 If a dragon lands inside the college after Faralda asks you to cast the spell, she will immediately run up to the college. You will not be able to interact with her again until the dragon is dead. ? 10 I've found the College of Winterhold, where mages study the arcane arts in Skyrim. If I want to learn more about magic, I'll need to join their ranks. 20 In order to join the College of Winterhold, I need to show I'm capable of simple magic by casting a Magelight spell..
21 In order to join the College of Winterhold, I need to show I'm capable of simple magic by summoning a Flame Atronach. 22 In order to join the College of Winterhold, I need to show I'm capable of simple magic by casting a Firebolt spell. 23 In order to join the College of Winterhold, I need to show I'm capable of simple magic by casting a Fear spell. 24 In order to join the College of Winterhold, I need to show I'm capable of simple magic by casting Healing Hands on Nirya at the entrance to the College. 30 I've been allowed to join the College of Winterhold, and need to find Mirablle Ervine for a tour of the grounds. 40 I have joined the College of Winterhold. Mirabelle Ervine has agreed to show me around in order to become familiar with the grounds. 50 I have joined the College of Winterhold, and after a tour of the grounds need to find Tolfdir, who looks after the new Apprentices. 200 Finishes quest After joining the College of Winterhold and speaking with Tolfdir, I've learned a bit about wards and will be accompanying some of the others on an expedition. The following empty quest stages were omitted from the table: 0, 3. On the PC, it is possible to use the console to advance through the quest by entering setstage MG01 stage, where stage is the number of the stage you wish to complete. It is not possible to un-complete (i.e. go back) quest stages, but it is possible to clear all stages of the quest using resetquest MG01. This page was last modified on 22 July 2018, at 08:38.